The final goal of the concert hall acoustics is to optimize the acoustic properties to satisfy the subjective preference of all of the audience. For this purpose, the individual difference of the subjective preference must be considered. It is acknowledged that the acoustic qualities are not uniform throughout a hall. This means that there is a possibility for all listeners to find his/her best seat in a hall. When a listener purchases (selects) a ticket for a concert, which criteria is important to select a seat in a theater? Usually, people select a seat according to the visual criteria, that is, the good view of the stage, not acoustical criteria. But it could be nice you can choose a seat which has good acoustical criteria like the clearity of the sound, appropriate sound level, rich reverberation, and spatial impression. How can we know our own sound preference? During the demonstration, the audience was asked to move the seat and experienced how the acoustics of each seat changes. We can try a sound field of a seat and compare it with one other seat, and then, compare it with one other different seat... But there are too many seas in a hall. It taks a long time and the criteria of the judgment are vague. If the sound field of a hall can be reproduced by headphones, or loudspeakers in a (small) room, the comparison becomes more easy. Here, there are some examples of a music (dry source) convolved with sound filed in the Kirishima International Concert Hall. Impulses responses at several seats. (More precisely, the sound field between the headphones (or loudspeakers) and the listener's ear shold be canceled). The "seat selection system" helps the audience of concert hall to find seats which have their preferred acoustical conditions. Core technologies of this system are measurement or simulation of the binaural impulse responses in each seat, sound field simulation via binaural reproduction, subjective test by paired comparison, and seat selection by matching of subjective preference and objective parameters. 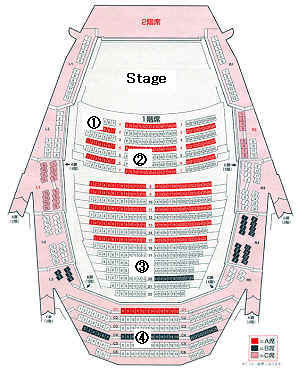 The seat selection system in a concert hall or through internet enviromnet is proposed. By applying the cross-talk cancelling filter to the anechoic signal convelved with an impulse response of a hall, not only the temporal characteristics but also spatial information (size and direction of the auditory image) can be reproduced. Then, the problem is how to evaluate the sound field. Paired comparison method is simple enough to compare different sound fields. There are four acoustical parameters to evaluate the sound quality of a seat of a hall. Those parameters corresponds to loudness, reverberance, and spaciousness of sound field. The important point here is that listener's sensitivity is also calculated for each parameter from a preference function in addition to the preference score. The total preference score is found as a sum of each score. To calculate a listener's preference score at certain seat, the acoustic properties at that seat is measured before. Those acoustic parameters are calculated by the impulse response measurement. By comparing the listener's preferred values and the seat's physical values, preference score for the listener is calculated for every seat. Results are displayed as a seating map with different colors depending on the score. More number of database of hall acoustics should be collected. There two ways to get the acoustical data at each seat of halls. One is the acoustical measurements throughout the audience area, the other is the computer simulation from the architectural drawings and the material information. To test the subjective preference and obtain the optimum acoustical conditions of each listener, the sound reproduction system for auralization should be improved. The probrem includes how to compensate 'Unknown user system'. The linkage with the ticket issuing system is also needed.